Inside Philadelphia Distilling in Fishtown. Philadelphia Distilling, known for its Bluecoat American Dry Gin, is throwing a unique party on Sunday, Oct. 14, at its distillery in Fishtown. At the event, which is free to attend, there will be live demos, giveaways and complimentary food prepared by guest chef Scott Schroeder from Hungry Pigeon, a popular all-day café in Philly's Queen Village. 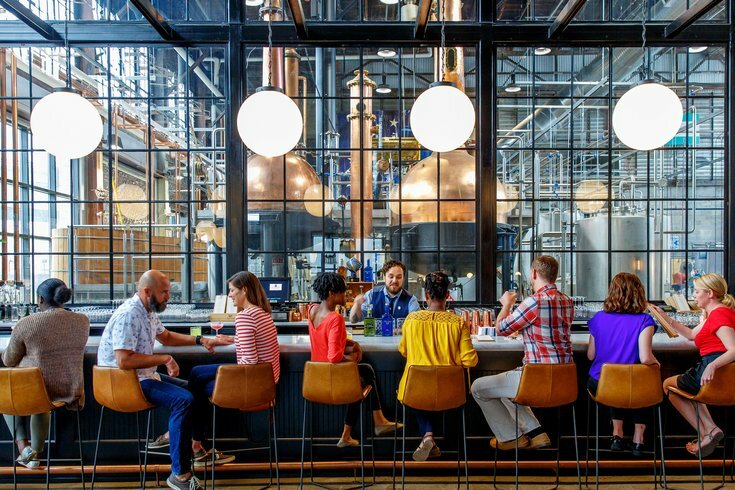 At the distillery's cocktail bar, which overlooks the hand-hammered copper stills and gin production, bartenders will show off their craft cocktail skills. Guests can purchase a seasonal drink to sip while watching the demonstrations from local artists and craftsmen. Watch and learn how to construct a bar cart, or how to turn a gin bottle into a terrarium. There will also be glass blowing demos at the event, and a muralist will be on-site creating a new mural. All party-goers will get a keepsake for attending, too. The complimentary gift will be a cement case of the Philadelphia LOVE sculpture made by Mark Melowas from LukeWorks. The free party will take place 2 to 6 p.m.